Matthew Parrish, has ‘come into his own’ as a sought after performer, arranger, and composer. Matthew brings skills and swing as he puts his heart into every note he plays. He has a genuine warmth and loyalty to the music that transcends into every note, every tune, and every interaction with his fellow musicians. Born in central California to hard-working, music-loving parents of four children, Matthew is the youngest to his next sibling by eleven years. With a variety of jazz, rock, and classical music being played around him since birth, whether live or recorded, and a father who played acoustic bass early in his military career, Matt was destined for a life dedicated to music. Although he started on trumpet in middle school, he switched from that instrument for the acoustic bass in a last minute decision of the heart right before his Rutgers Mason Gross School of the Arts music program audition. He was accepted as an acoustic bass student in jazz studies and he has never stopped learning his craft. Matt’s young bass career is grounded in Philadelphia, PA. He had the blessing, in his late teens and early twenties, of performing with Shirley Scott, Mickey Roker, Bobby Durham, Cecil Payne, Johnny Coles, Harry ‘Sweets’ Edison, Jimmy Oliver, Danny Turner, and fellow young musicians, Orrin Evans and Byron Landham. Matthew went on to have the unforgettable experience of touring with legendary trombonist, Al Grey. This era also included performing with Clark Terry, Marion McPartland, Dr. Lonnie Smith, Lou Donaldson, Joe Cohn, Savion Glover, and Bill Charlap. After the sad passing of Al, an important mentor and friend, Matthew continued to tour with the bands of Greg Osby, Jon Jang, James Newton, Stefon Harris, and Regina Carter. Matt came to be relied upon as a gifted composer and arranger in addition to his steady performing. His own works, as played by Matt on bass, are on his debut CD, ‘Circles’ (Hipnotic Records), as well as on recordings from Regina Carter and Dave Leonhardt, Denise Montana, and Ben Schachter. Since Matthew has always believed that recording music is paramount to his career as it is timeless and marks musical milestones, he is grateful to have recorded with the above musicians. Matthew also has recorded with Wynton Marsalis, Dee Dee Bridgewater, Paquito D’Rivera, Clark Terry, Etta Jones, James Williams, Harry ‘Sweets’ Edison, James Newton, Miri Ben-Ari, Gary Thomas, Vana Gierig, and Orrin Evans, to name a few. Currently, Matt continues to tour throughout the United States, Europe, Asia, and South America with bands of the legendary Freddy Cole, Houston Person, and Vana Gierig. For over three years and counting, Matt has also presented his own popular showcase concerts in the Philadelphia area, with everything from an old-school, Philly-tinted ‘tenor sax battle’ with Larry McKenna, Bootsie Barnes, Houston Person, and Tim Warfield, to a Brazilian ‘jungle jazz’ concert featuring Amazonian performers Karine Aguiar, Ygor Saunier, and Vinicius Barros, with Vana on piano, and Marcello Pellitteri on drums. No stranger to the New York City jazz scene, Matt frequents the Jazz Standard, the Blue Note, Dizzy’s ‘Coca Cola’ Club at Lincoln Center, Smalls, Birdland, and the Iridium. He is also no stranger to Washington, D.C. and Boston, MA jazz clubs and, of course, he is a devoted Philadelphia, PA performer. 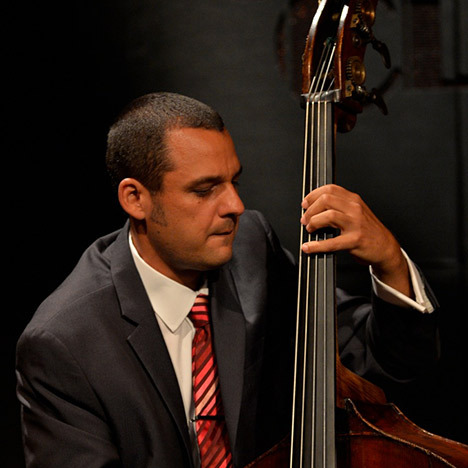 With decades of his life devoted to the art of jazz bass, Matthew shares his experience by teaching and mentoring young children through adults in assemblies, master classes, and lectures throughout the United States. From the CD album John David Simon And Friends With Clark Terry & Etta Jones on WarmGroove Records.